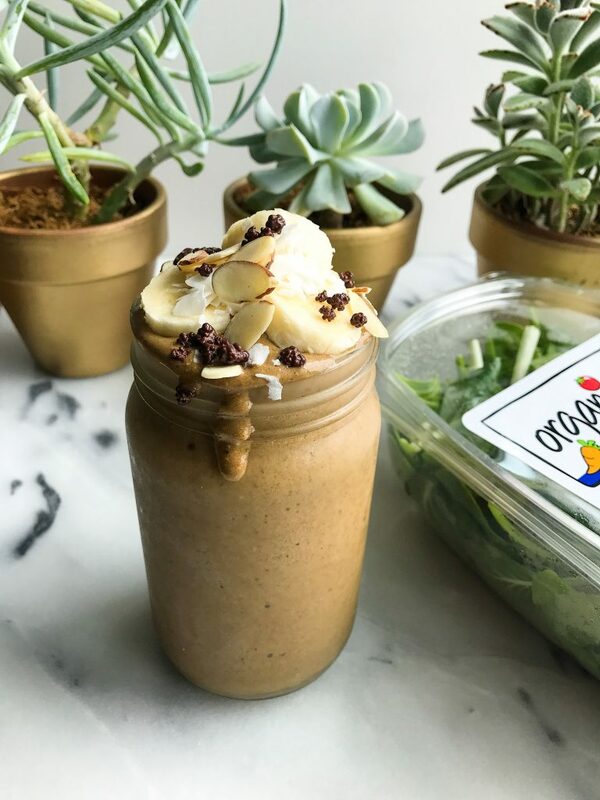 Veggies in Smoothies 101 + My Absolute Favorite Zucchini Bread Smoothie! You guys, I have officially converted. The girl who never liked smoothies and spent abut 20 years telling people that, officially is loving smoothies. But in my defense, I really only like smoothies thick enough to eat with a spoon. No straw drinking type smoothies are happening over here. What I love about having smoothies is how much random goodness I can add to the blender to get more nutrients. I add anything from cauliflower to zucchini to GREENS in my smoothies. You don’t taste any if it in there I promise. I add enough other tasty stuff so you won’t even know there are vegetables in your smoothie. 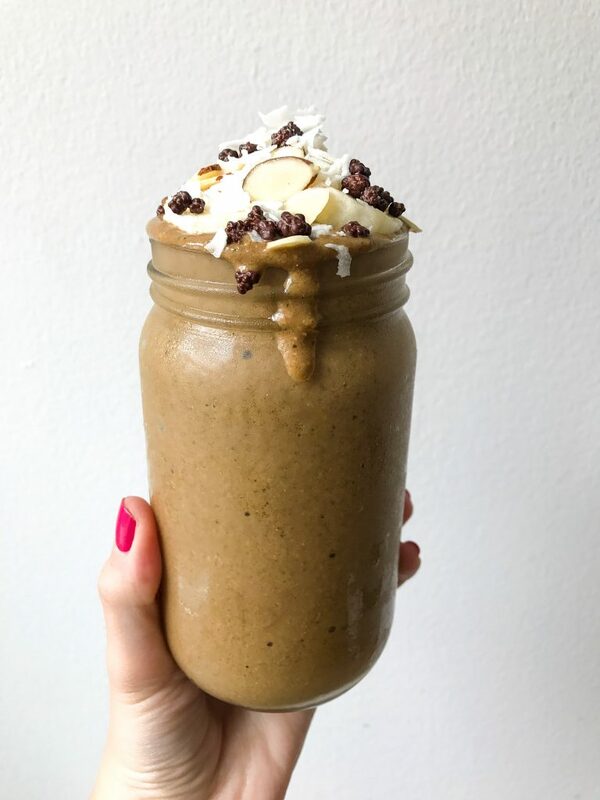 This smoothie I am sharing with you today is My Absolute Favorite Zucchini Bread Smoothie. Like UNREAL favorite smoothie. 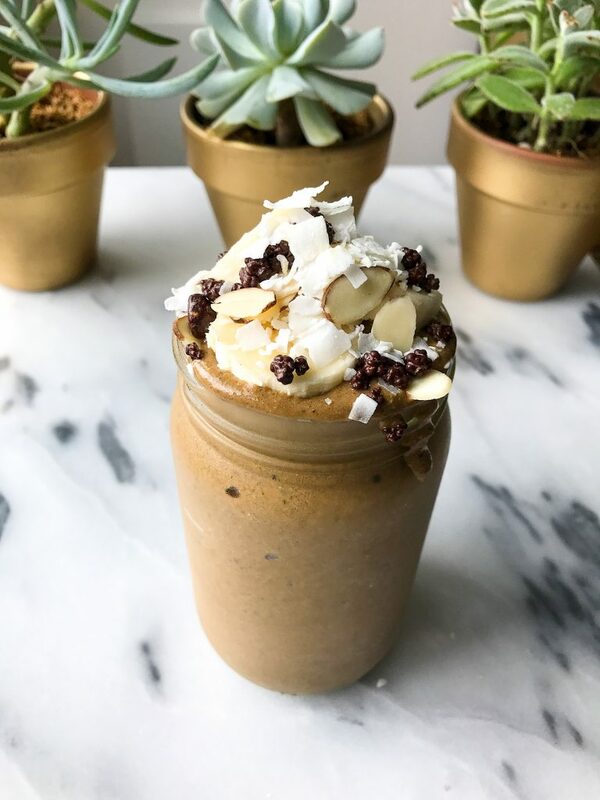 I make it a few days a week and it is my go-to when I need an easy breakfast, afternoon pick me up or let’s be real, when I don’t want to make dinner and a smoothie sounds 100x easier. But first, I want to walk you though my 3 go-to veggies to add to smoothies and how I prepare them for my smoothies. I get a TON of questions on this and want to outline it for ya’ll to have here. If you have any other questions, comment on my IG or below and I will add more info here. Cauliflower: Since late winter, I have been LOVING cauliflower in my smoothies. I purchase the frozen organic florets from Whole Foods. I boil a big pot of water, add the cauliflower in and cook for about 5-7 minutes. Then I strain in the sink, rinse in cold water in store in the fridge. You CAN use the cauliflower raw or frozen but I personally digest it better when it is steamed and NOT frozen (find what works for you!). I don’t think you taste it when you use cauliflower, it really just adds a creamy consistency without added sugar. If you are hesitant, start with 1/2 a cup and mix with a banana! I also store it in the FRIDGE not freezer because I don’t like to give my body all frozen food as soon as I wake up. Zucchini: My personal favorite veggie to add to my smoothies. I slice up zucchini and then freeze it. I do not steam or cook beforehand although you absolutely can. I use these bags to keep them in the freezer! They are AMAZING. Organic Girl Greens: I’m so bad at getting greens in more than once a day so adding any of Organic Girl’s variety of greens really helps me get extra nutrients. I use them all raw but you can also cook and freeze them if you prefer. They will stay longer that way too! Now for this Zucchini Bread Smoothie, I added Organic Girl Super Spinach, which blends baby spinach, baby bok choy and baby kale. SO GOOD! You can add any of Organic Girl’s greens to the smoothie though. Get creative friends! Top with your preferred toppings, I used a little banana, coconut, almonds and chocolate chia seeds! Granola would be great too. If you do smoothies right they can be so good; it’s like spooning a Wendy’s frosty but it has so much nutrition in it that’s really fueling your body well. You have such great tips! I generally make smoothies five days a week, and (like you) I love spinach in them! I want to try getting in more zucchini/cauliflower in, so thanks for this recipe! I’ve been following your blog for a while – your banana bread is my go to comfort food (and doesn’t have me hating myself the next day). I have been adding cauliflower to my smoothies this past year and want to experiment with zucchini. Can you advise why you prefer to not steam the zucchini? Are there digestive or health benefits?